The GDS Strike continues on 14th Day – Government should intervene and settle. 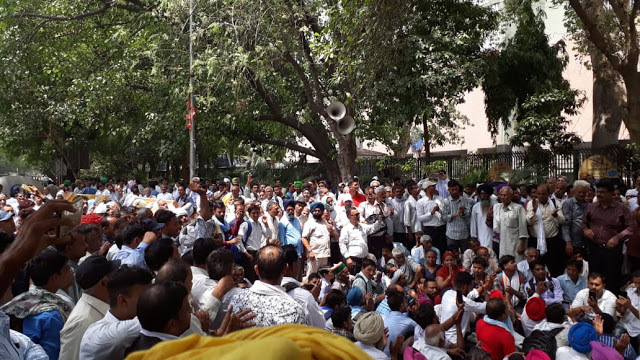 Almost the entire two and half lakhs Gramin Dak Sevak (GDS) workers, who runs the Postal Services in the rural areas and partially in the cities, are completely on strike for the last two weeks since 22nd May 2018, demanding implementation of the Kamalesh Chandra Committee report on the wage and service conditions of the GDS. The report was submitted on November 2016 to the Government, which have some favorable recommendations. While the government implemented the recommendations of the VII Central Pay Commission, which are mostly retrogressive, for the regular employees stating that the committee reports are treated as ‘Awards’, the GDS Committee report is not implemented. The entire rural postal service is paralyzed. No letters, money orders, parcels, speed posts, registered articles delivered. About 1,30,000 Sub and branch Post Offices in the country closed due to strike. Still the government is silent and is not prepared to meet the unions, discuss and settle the issues. Despite their difficulties, the common people support the striking workers, well knowing under what conditions and negligent low wages they are working without any benefits that the workers are eligible. They understand the wage slavery imposed on the GDS workers. All the trade unions in the country and political parties are supporting the poor underpaid GDS workers’ strike; But the government is still silent and unresponsive. It was in the same way when it dealt with the demands of the kisans and other workers. The GDS workers are firm in their decision to continue the indefinite strike till their fully justified demands are met. The regular employees, who withdrew from the strike after a few days,are fully in solidarity with the striking GDS comrades. The central government should immediately discuss with the union leaders and concede the fully justified demands, so that the strike can be ended and the Postal services restored.